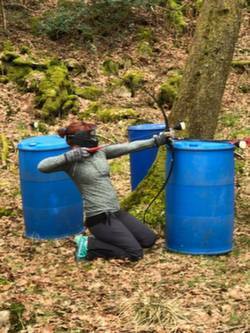 All year round Archery Tag and Archery Tag Games, Torver, Coniston. Near to Windermere, Ambleside, Keswick, Kendal and Bowness Lake District, Cumbria. 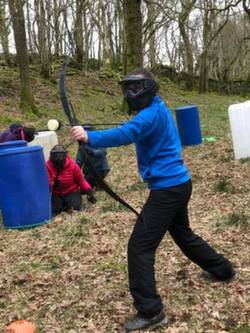 Our Archery Tag site is in Torver near to Coniston in the South Lake District with easy links from Keswick, Windermere, Coniston, Kendal, Ambleside, Bowness, Ulverston and Barrow. 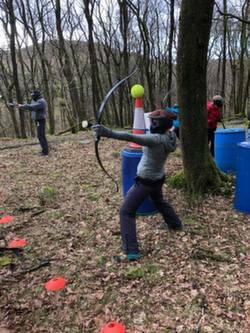 Archery Tag site in Torver, Coniston, in The Lake District operates in a different way to other Archery tag sites. For starters the games are held in beautiful woodland rather than on a court or in a sports centre. 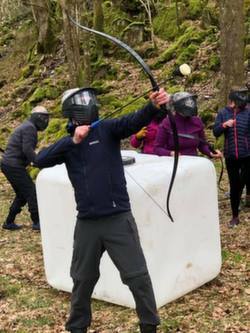 We offer our Archery Tag to PRIVATE group's unless its a special Archery Tag open day on our website or facebook group or unless we feel the extra numbers will make your Archery Tag games session a better one. It's your Archery Tag experience and we run it the way you want it! WE DON'T MIX AGE GROUPS UNLESS YOU HAVE A MIXED GROUP, THIS ENSURES ADULT GROUPS WILL NOT BE PLAYING ARCHERY TAG WITH JUNIOR BIRTHDAY PARTIES! sessions are run with safety coming first and then it's fun and laughs all the way. 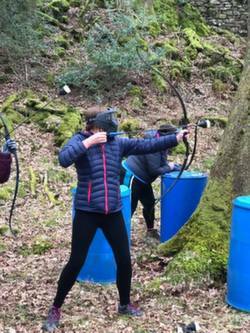 We want our Archery Tag sessions and Archery Tag days to mirror our other activities and to run in a fun, relaxed way; games are fast and furious ensuring maximum amount of time spent playing! A half day Archery Tag session usually includes up to 6 to 8 games, but this always depends on how fired up you are and how long you want to stay, our sessions usually run over the 3 hours if you want it to at no extra charge! Another great day with Dave, Kety & the team- including Quackers! Archery tag was a new activity for us. All of our party, which included a wide range of ages and abilities- could get involved. Played in teams- fast paced fun! Then an afternoon of rock climbing- which was excellent, well organised and challenging. Adventure 21 are a fantastic crew- always guaranteed to provide a great day- with lots of laughs!